Sadie Tierney’s latest work draws on the landscape of the industrial island city of Portsmouth where she has her studio. 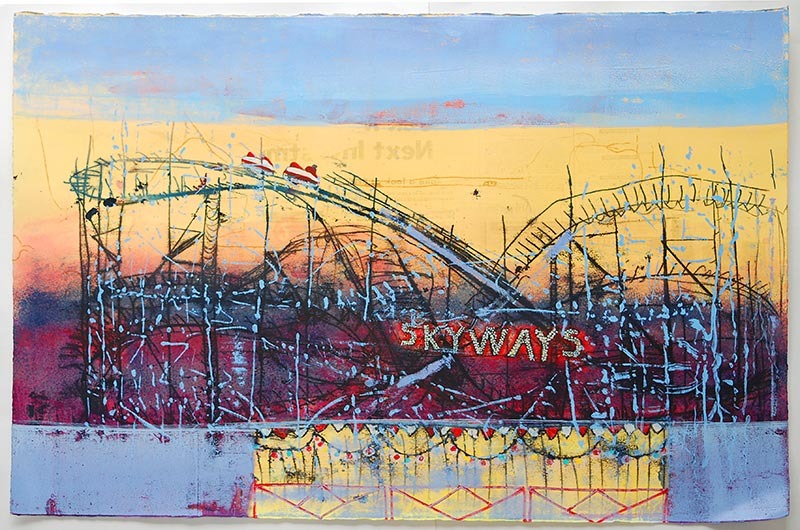 In this new series of prints, partially abstracted renditions of rollercoasters, steel ships and other contemporary structures are set against the sea and sky. Although working directly from life, her work is less concerned with the accurate depiction of objects through observed verisimilitude. The artist instead places a greater emphasis on attempting to describe visual sensation, experience and emotion through celebratory use of colour and line. The seascape has changed since Turner and Wyllie’s time, but Tierney honours the tradition of these early romantic landscape painters by making all the preparatory drawings and preparing printing plates as they did ‘en plein air’. Other influences come from traditions of art outside Western culture: Japanese print and Chinese scroll painting. Children’s art is also a great inspiration to the artist. In particular the expressive interpretation of objects and events through subtle variation of motifs repeated, in order to analyse and understand the world. Sadie Tierney focuses on objects and places where form is linked to emotion, metaphor and movement or change in these vibrant and expressive new pieces. All the prints in this new series, drypoints, lithographs, monoprints and etchings are individually printed in small editions and hand coloured by the artist on an 1840s cast iron etching press in her home studio, or where scale necessitates on larger presses at Omega Studios. A graduate of MA Printmaking at the Royal College of Art, Sadie Tierney’s solo exhibitions include Flowers East, Rabley Contemporary, Oxford Gallery and Aspex Gallery Portsmouth. Group shows include Transition, Rivington Gallery and Clifford Chance in London, Hatton Gallery (Newcastle University) and Millais Gallery (Southampton University). The recipient of two Arts Council Grants for the Arts Awards, other prizes include the Alkazzi Travel Fellowship, the Printmakers Council Award and the Peterborough Prize (finalist). Her work is held in the collections of The Bronx Museum of the Arts, Eton College, The Royal Navy, Baker & MacKenzie and Clifford Chance, as well as private collections in Europe, Hong Kong, South America and USA.